ZAERO integrates the following steady/unsteady ZONA aerodynamic engineering codes. ZONA6 for steady/unsteady subsonic aerodynamics for wing-body/aircraft configurations with external stores/nacelles including body wake effects. ZTAIC for unsteady transonic (modal) AIC’s using a transonic equivalent strip method. 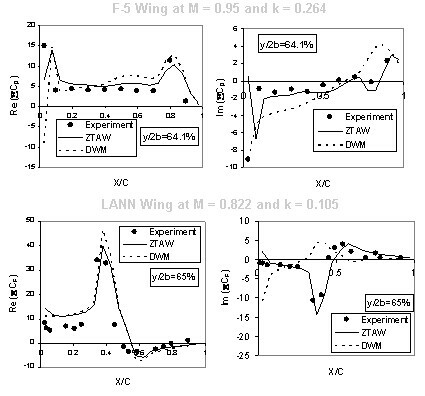 ZTRAN for unsteady transonic wing-body AIC matrix using overset field-panel method. 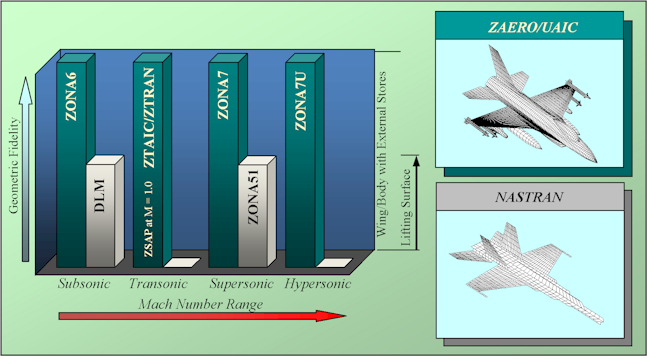 ZONA7 generates steady/unsteady supersonic aerodynamics for wing-body/aircraft configurations with external stores/nacelles (formerly ZONA51 for lifting surfaces). ZONA7U generates unified hypersonic and supersonic steady/unsteady aerodynamics for wing-body/aircraft configurations with external stores/nacelles. ZSAP for steady/unsteady aerodynamics at Mach one for wing-body aircraft including external stores. 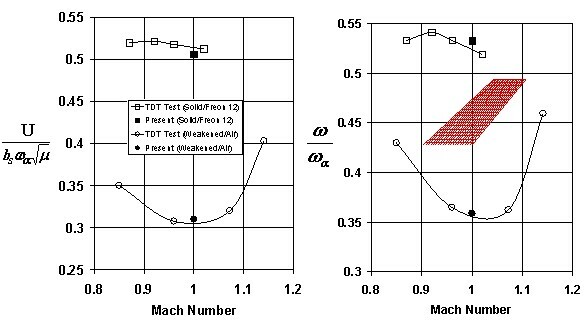 The applicable Mach number range of these codes and their geometric fidelity in contrast to the Doublet Lattice Method (DLM) and ZONA51 (currently the Aero Options I/II in MSC.Nastran) are shown in the following figure. To provide for a common aerodynamic results format generated from these steady/unsteady codes listed above, a unified Mach number Aerodynamics Coefficient (UAIC) module has been implementented within ZAERO. The functionality of the UAIC module is to provide the needed AIC matrix according to the input flight condition for any given Mach number. In addition, a ZONA Transonic AIC Weighting (ZTAW) module is available to correct the AIC matrix using the downwash weighting matrix method or the force correction matrix method. Generates steady/unsteady subsonic aerodynamics for wing-body/aircraft configurations with external stores/nacelles including the body-wake effect. 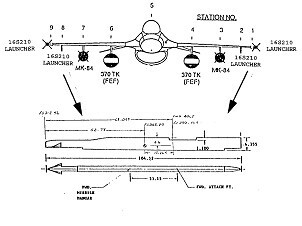 Any combinations of planar/nonplanar lifting surfaces with arbitrary bodies including fuselage+stores+tip missiles. 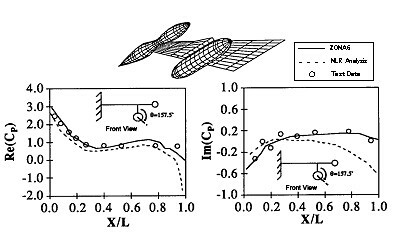 Higher-order panel formulation for lifting surfaces than the Doublet Lattice Method (DLM). First case below shows the ZONA6 robustness over DLM. 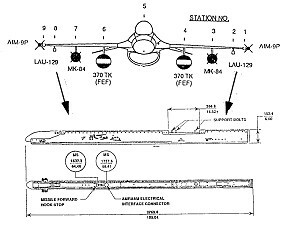 High-order paneling allows high-fidelity modeling of complex aircraft with arbitrary stores/tip missile arrangement. Second case below shows the solution improvement with ZONA6. Generates an unsteady transonic AIC matrix that has the same form as the ZONA6 and ZONA7 AIC. ZTRAN solves the time-linearized transonic small disturbance equations using an overset field-panel method. The surface box modeling is identical to that of ZONA6 and ZONA7. Only a few additional input parameters are required to generate the volume cells. The variant coefficients in the time-linearized transonic small disturbance equation are interpolated from the Computational Fluid Dynamics (CFD) steady solutions. The overset field-panel scheme allows the modeling of complex configurations without extensive field panel generation effort. 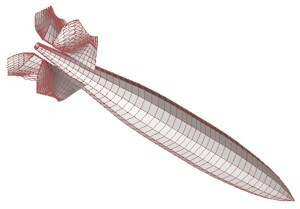 Generates steady/unsteady supersonic aerodynamics for wing-body/aircraft configurations with external stores/nacelles. 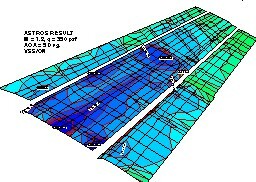 Panel formulation for lifting surfaces is identical to that of ZONA51 (the industry standard method for supersonic flutter analysis in MSC.Nastran). Generates unified hypersonic and supersonic steady/unsteady aerodynamics for wing-body/aircraft configurations with external stores/nacelles. 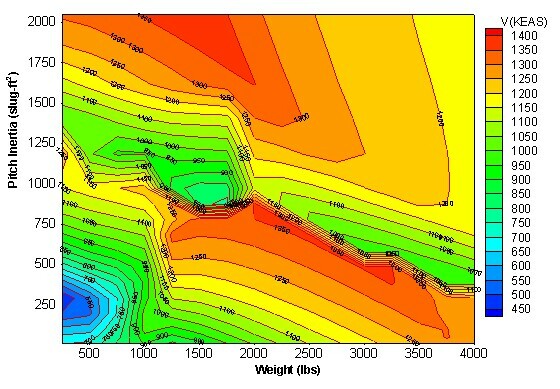 Nonlinear thickness effects of ZONA7U yields good agreement with Euler solution and test data. Steady solutions approach linear and Newtonian limits. Confirms hypersonic Mach independent principle. 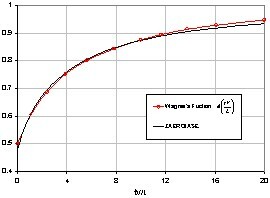 Results/formulation are superior to Unsteady Linear Theory and Piston Theory. ZONA7U usually results in more conservative flutter boundaries than other methods. Unified with ZONA7 and is therefore applicable to all Mach numbers > 1.0. Additional input to ZONA7 amounts to only wing root and tip sectional profile thickness. - Thickness effect apparent at higher M, thus yielding more conservative flutter boundaries. 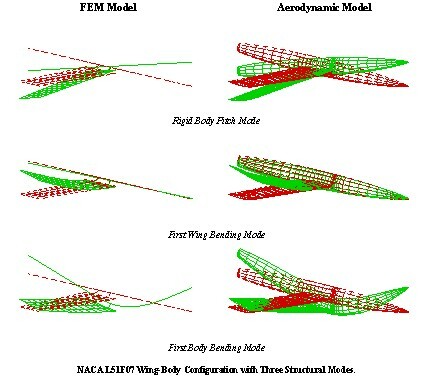 Generates steady/unsteady aerodynamics at sonic speed (M=1.0) for wing-body/aircraft configurations with external stores/nacelles. Computes the steady/unsteady aerodynamics at exactly Mach 1.0. Paneling scheme is identical to that of ZONA6/ZONA7, therefore, no addional modeling input is required over the existing ZONA6/ZONA7 aerodynamic model. Computational time is on the same order as that of ZONA6 and ZONA7. - Canard-Wing Configuration is in a Canard Pitch Motion about its Mid-Chord. - Lift on Wing is mainly induced by the oscillatory wake from Canard. 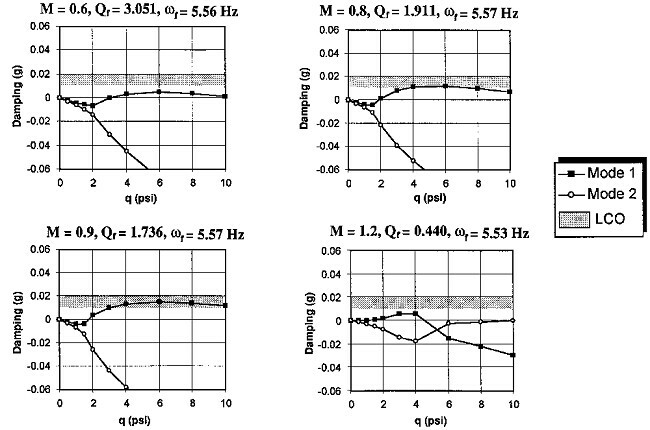 - Real and Imaginary Parts of Lift at M=1.0 are compared against the Subsonic (ZONA6 Method) at M=0.99 and the Supersonic (ZONA7 Method) at M=1.01. - ZONA6 and ZONA7 require large number of Boxes for solution convergence, whereas ZSAP does not. - Comparison made of Flutter Speed Index and Flutter Frequency Ratio with TDT wind tunnel measurements. Generates a corrected AIC matrix to match the given set of forces/moments or unsteady pressures. The AIC correction module computes the AIC weighting matrix using a ZONA Transonic AIC Weighting (ZTAW) method that adopts a successive kernel expansion procedure. by Pitt and Goodman. With in-phase pressures obtained by wind-tunnel measurement or CFD, ZTAW yields accurate out-of-phase and higher frequency pressures resulting in well-correlated aeroelastic solutions, whereas, the previous methods yield erroneous out-of-phase pressure in terms of shock jump behavior. Four methods are incorporated within ZTAW: the steady downwash weighting matrix method, the unsteady downwash weighting matrix method, the steady force correction matrix method, and the unsteady forc correction matrix method. The HFG module is capable of modeling any full aircraft configuration with stores and/or nacelles. 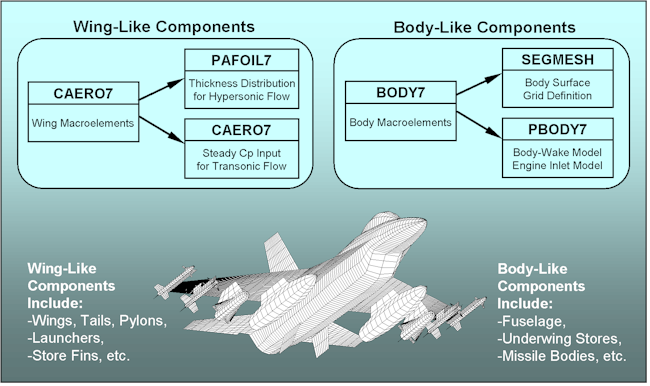 A complex aircraft configuration can be represented by the HFG module by means of wing-like (CAERO7) and body-like (BODY7) definitions. User-friendly CAERO7 and BODY7 macroelements make it easy to set up any arbitrary wing-body input. The 3D Spline module establishes the displacement/force transferal between the structural Finite Element Analysis (FEA) model and the ZAERO aerodynamic model. It contains four powerful spline methods that jointly assemble a spline matrix. These four spline methods include: (a) Thin Plate Spline; (b) Infinite Plate Spline; (c) Beam Spline and (d) Rigid Body Attachment methods. 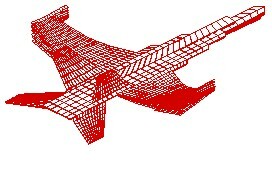 The spline matrix provides the x, y and z displacements and slopes in three dimensions at all aerodynamic grids. The matrix entity manager is designed to store and retrieve very large, often sparse, matrices. It minimizes disk storage requirements while allowing algorithms to be developed that can perform matrix operations of virtually unlimited size. Relational entities are essentially tables. Each relation has data stored in rows (called entries) and columns (called attributes). Each attribute is given a descriptive name, a data type, and constraints on the values that the attributes may assume (i.e. integer, real or character data). These definitions are referred to as the schema of the relation. Often times a software module requires temporary, or scratch, disk space while performing tasks. The data generated within these tasks are generally "highly-local" and, due to the modular nature of the software, are not be passed through arguments to other modules within the system. To effectively accommodate the transfer of this type of data, ZDM supports an unstructured database entity type composed of "records" that may contain any arbitrary collection of data. The dynamic memory manager consists of a suite of utility routines to allocate and release blocks of dynamic memory. The Dynamic Memory Manager provides the capability of developing an engineering software system which allows operations to be performed on data that would normally exceed the size of available memory. 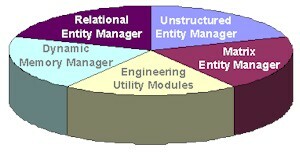 Engineering utility modules contain a pool of routines that perform operations on matrix database entities. These operations include matrix decomposition, eigenvalue solver, matrix multiplication, matrix partitioning/merging, etc. These routines first check the property of a given matrix and then select the appropriate numerical technique to perform a particular matrix operation. 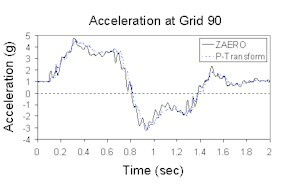 ZAERO utilizes the bulk data input format, similar to that of NASTRAN and ASTROS. This type of input format has the advantage of: (a) minimizing the user learning curve, (b) relieving user input burden, and (c) automated input error detection. An example of this type of input format is shown below. ZAERO allows for the graphic interface with numerous commercialized graphic packages. Graphical data in output files containing the aerodynamic model, unsteady pressures, interpolated structural modes, flutter modes, and transient responses can be displayed via Patran, Femap, Ansys, Ideas, Elfini, Pegasus or Tecplot. V-g and V-f diagrams can be displayed via typical X-Y plotting packages such as Microsoft Excel. The ZAERO flutter module contains two flutter solution techniques: the K-method and the g-method. The g-method is a ZONA developed flutter solution method that generalizes the K-method and the P-K method for true damping prediction. 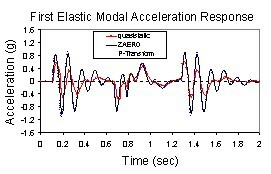 The P-K method is only valid at the conditions of zero damping, zero frequency, or linear varying generalized aerodynamic forces (Q) with respect to reduced frequency. In fact, if Q is highly nonlinear, it is shown that the P-K method may produce unrealistic roots due to its inconsistent formulation. ZAERO's flutter module has a built-in atmospheric table as an option to perform matched-point flutter analysis. 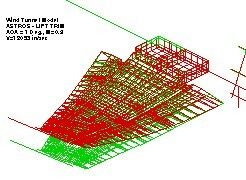 Sensitivity analysis with respect to the structural parameters is also included in the g-method. 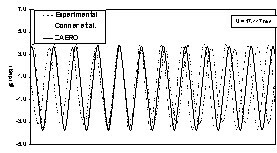 - A non-zero frequency “dynamic divergence speed” is well predicted by the g-method, the P-K method and the transient method. 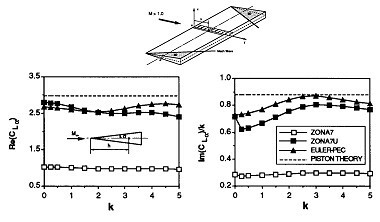 - Both the g-method and the transient method capture two aerodynamic lag roots which are absent in the P-K method solution. Performs a parametric flutter analysis by executing a massive number of flutter/ASE analyses for various mass and stiffness distributions. where MB and KB are the mass and stiffness matrices of a baseline structure and ΔM and ΔK are the incremental changes of mass and stiffness from the baseline structure to the i-th structure of interest. Data mining the massive flutter results by automatically searching for the velocity-damping curve crossing at user-specified damping levels. Ease for post-processing using off-the-shelf graphic tool such as Tecplot. 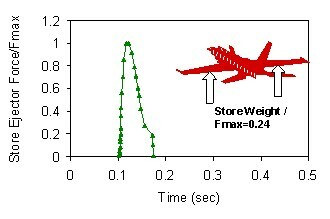 Shown in the figure below is the flutter speed vs. various pitch inertia and weight diagram of the store. Flags to indicate the severity of the flutter instability. 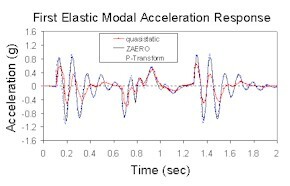 ZAERO provides analytical sensitivities of flutter parameters (frequencies and damping) with respect to structural design variables. Using the same set of generalized coordinates, such as the normal modes of a baseline structure, sensitivities can be computed without returning to the finite-element model. 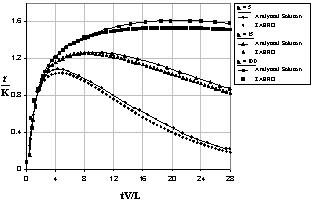 which is the sensitivity of damping of the j-th mode with respect to the i-th design variable. 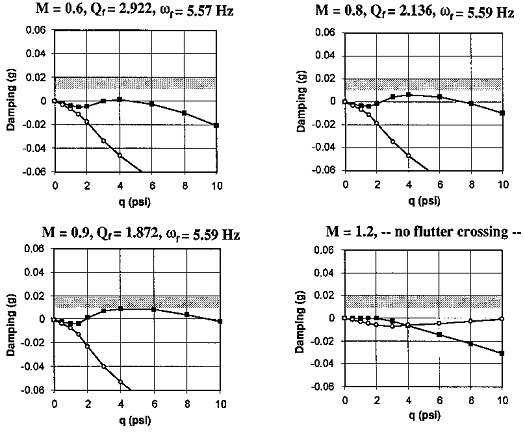 which is the sensitivity of flutter reduced frequency of the j-th mode with respect to the i-th design variable. where A and B can be derived using the orthogonality of the right and left eigenvectors of the flutter equation. 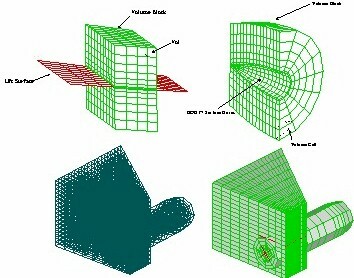 Computing A and B requires additional structural information from the finite element code; the derivatives of the stiffness and mass matrices with respect to the design variables. These matrices are imported from the finite element code through a DMIG bulk data input card. Performs the static aeroelastic / trim analysis for solving the trim system and computing the flight loads. Employs the modal approach for solving the trim system of the flexible aircraft. The modal approach establishes a reduced-order trim system that can be solved with much less computer time than the so-called “direct method”. Capable of dealing with a determined trim system as well as the over-determined trim system (i.e., more unknowns than the number of trim equations). The solutions of the over-determined trim system are obtained by using an optimization technique that minimizes a user-defined objective function while satisfying a set of user-defined constraint functions. 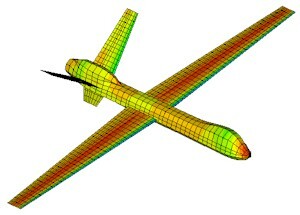 For a symmetric configuration (about the x-z plane), the Trim Module requires only that one-half of the configuration be modeled, even for an asymmetric flight condition. Generates the flight loads on both sides of the configuration in terms of forces and moments at the structural finite element grid points. Output are Nastran FORCE and MOMENT bulk data cards that can be used in subsequent detailed stress analyses. Performs the aeroservoelastic analysis with margin analysis for SISO/MIMO control systems. 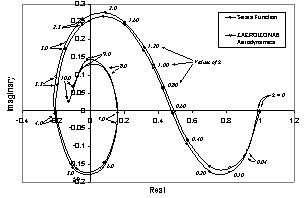 The ASE module performs stability analysis of either the open-loop system or the closed-loop system. 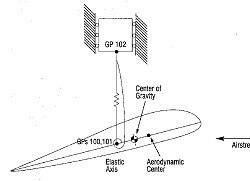 It is formulated by the state space equation that includes the modeling of the sensors, actuators and control system. The following Figure illustrates the computational procedures of the ASE module to construct the closed-loop state-space equation. The ASE module first generates the state space equation of the aeroelastic system by combining the generalized structural matrices with the generalized aerodynamic force matrix. The output equation of the state space equation is defined by the sensors. 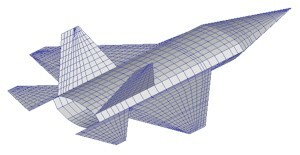 The generalized aerodynamic force matrix is transformed into the rational function using the rational function approximation (RFA) technique so that it can be easily incorporated into the aeroelastic state space equation. Two methods are available in the ASE module to perform the RFA; the Roger's method and the Minimum State Method. Next, the aeroelastic state space equation is combined with the state space equation of the actuator model to construct the state space equation of the plant model. This plant model is then combined with the state space equation of the control system to form the state space equation of the vehicle model. The control system can be represented by a serious of single-input-single-output (SISO) and/or multi-input-multi-output (MIMO) control elements. An upstream control element and a downstream control element can be connected by either a fixed gain connection or a variable gain connection. Finally, the closed-loop state space equation can be obtained by applying the gain matrix to the vehicle system. Damping and frequency of the closed-loop system at each density and velocity pair can be computed by solving the eigenvalues of the closed-loop system matrix. Meanwhile, gain margin and phase margin of the closed-loop system also can be evaluated. Bode diagrams also can be generated. The state space equations of the aeroelastic model, the plant model, the vehicle model and the closed loop model can be exported from the ASE module and imported into other control system design codes. 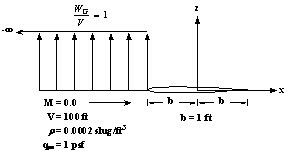 A frequency-domain approach is also incorporated in the ASE module that does not require the rational function approximation of the generalized aerodynamic force matrix. Because RFA could introduce error, by avoiding the RFA the frequency-domain solution is considered as the exact solution that can be used to validate the solution computed by the state space approach. Performs a transient discrete gust loads or continuous gust response analysis of an aircraft structure subjected to air gust. Includes various options for defining the discrete gust profile such as one-minus-cosine, sine, sharp-edged gust, and arbitrary gust profiles for discrete gust and Dryden’s or Von Karman’s gust spectrum for continuous gust. The frequency-domain approach: both the system matrix (of either open-loop or closed-loop systems) and the gust loads are constructed in the frequency-domain using the Fourier Transform. The time-domain transient response is obtained by the inverse Fourier Transform. The state-space approach: both the system matrix and gust loads are formulated in the state-space equations through the rational aerodynamic approximation. In order to circumvent the problem of poor representation of the gust loads by the rational aerodynamic approximation, a zonal approach is employed which is defined by the GENGUST bulk data card. 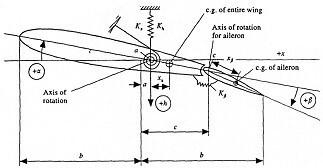 The hybrid approach: the system matrix is constructed through the rational aerodynamic approximation, whereas the gust loads is obtained by the Inverse Fourier Transform. The GLOADS modules state space equations provide accurate displacement time history; thereby circumventing the unreasonably large displacement response problem of the Fourier transform method in NASTRAN. Outputs the transient loads at each time step in terms of NASTRAN FORCE and MOMENT bulk data cards either by the mode displacement method or the mode acceleration method for subsequent detailed stress analysis. Performs a transient maneuver loads analysis due to pilot input commands. Formulated in state space form for either an open-loop or closed-loop system. The rigid body degrees of freedom are transformed into the airframe states so that sub-matrices associated with the airframe states, within the state space matrices, are defined the same as the flight dynamic states. 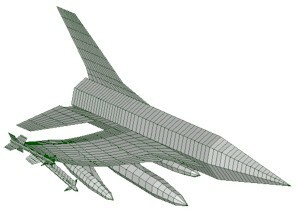 Allows you to replace the program-computed sub-matrices associated with the airframe states by those supplied by flight dynamic engineers. This ensures that the time response of the airframe states is in close agreement with those of the flight dynamic analysis. Computes the time histories of the maneuver loads of a flexible airframe in the presence of a control system. 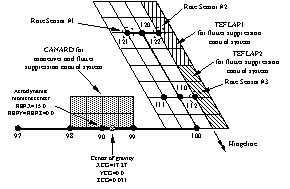 These maneuver loads include the time histories of component loads, grid point loads, etc. 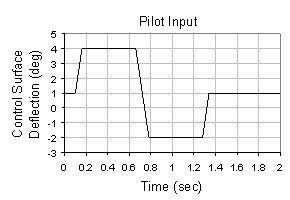 Based on these time histories of the loads, you can identify the critical maneuver load conditions. Outputs the transient maneuver loads at each time step in terms of NASTRAN FORCE and MOMENT bulk data cards either by the mode displacement method or the mode acceleration method for subsequent detailed stress analysis. Performs a transient ejection loads analysis due to store ejection. Allows for multiple store ejections (in sequential scheduling) while the aircraft is maneuvering under pilot input commands. Accounts for the effects of the sudden reduction in aircraft weight due to the separation of stores from the aircraft. Formulated in state-space form for either an open-loop or closed-loop system. Nonlinearites can be specified as a function of multiple user defined nonlinear parameters such as displacements, velocities, accelerations, element forces, modal values and control system outputs. Discrete time-domain state space equations at each distinct value of the nonlinear parameters are pre-computed. During the time-integration computation, updated state-space equations are obtained through interpolation. Outputs NASTRAN FORCE and MOMENT bulk data cards at a given time step for subsequent detailed stress analysis. The F-16 configuration MA41 experiences LCO from Mach 0.6 to 1.0 while configuration MA43 is free from LCO. ZAERO (the ZONA6 subsonic linear method) predicts a hump mode damping curve that falls within 1-2% damping (M=0.6 to 1.0) for configuration MA41 while configuration MA43 remains below 1%. 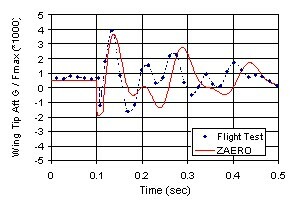 The onset of LCO as predicted by ZAERO (i.e., with the hump mode falling between 1-2% damping) correlates very well with flight test data. 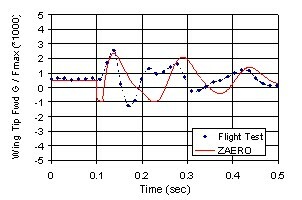 ZAERO's transonic unsteady aerodynamic method (ZTAIC) is used to perform the flutter analysis. The steady pressure input to ZTAIC is obtained from the CFL3D Navier-Stokes solver. 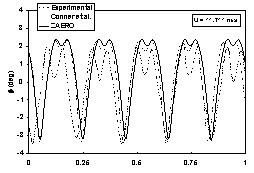 Unstable damping of Case 1 below approximately ranges from M = 0.85 to 1.0 with a frequency of 5.6 Hz which correlates very well with the flight test data. 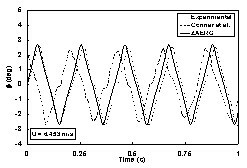 Similarly, good correlation is found for Case 2 below (LCO region at M>0.9 with a frequency 8.8 Hz). It employs the g-method to search for flutter solutions. The flutter solutions are obtained right after the mode tracking, unlike Nastan with which users have to further post-process Nastran outputs to find out flutter conditions. The gyroscopic effect which couples the pitching and yawing motion can be considered through propeller matrices or alternatively by FLUTTF bulk data card. MSC Nastran propeller matrix preparation program generated data file can be readily used. 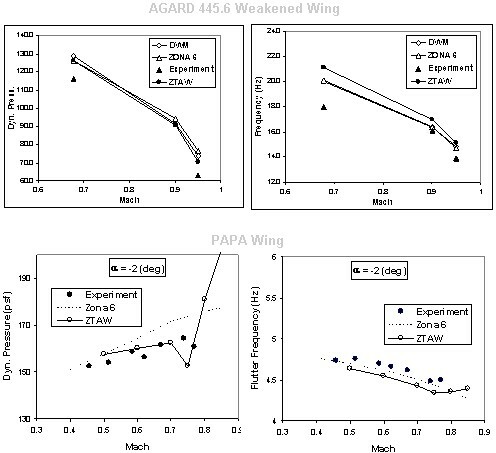 ASE open- and closed- loop stability analysis with propeller effects. Control system gain margin analysis with propeller effects is available similarly as ASE module.